The central black forest covers the region from Offenburg and Freudenstadt in the north to Waldkirch and Furtwangen in the south. Discover local customs and craftmanship, lovely towns with half-timbered houses, and visit the German clock museum in Furtwangen. The open-air museum Vogtsbauernhof, the Triberg waterfalls, valleys like the Glottertal, Kinzigtal and Simonswäldertal are favourite tourist destinations. The highest mountain, Kandel (1,241m / 4,072ft), along with a few other peaks higher than 1000m, are close to the southern black forest, flanking the Simonswaldtal. Like the other regions of the black forest, the central black forest offers so many activities to keep everyone happy. Access to the central black forest by car is easy. The Autobahn A5 (Frankfurt to Basel) runs parallel to the mountain range along the Rhine valley. Depending on your final destination, take one of the exits Offenburg, Lahr, Ettenheim or Riegel. These towns, and others, also have train stations if you want to visit the black forest by train. Let me show you my favourite spots im mittleren Schwarzwald. Follow the 3 drives I describe on this page to picuresque valleys, lakes and mountains. On this journey you are going to see the most beautiful towns with Fachwerkhäusern (half-timbered houses), following the Kinzigtal (valley of the Kinzig) downstream from Freudenstadt, using the Bundesstrassen B 294 / B 33. Good news is that you can take this tour with the railway as well. Kinzigtal - In its upper reaches the Kinzig is a typically narrow, winding mountain stream. The valley widens near Hausach on its way to Offenburg and to the river rhine. Freudenstadt (population 23,700) is internationally renowned as a Luftkurort (climatic health resort). The largest market square in Germany is surrounded by houses with arcades. A wonderful opportunity to go for a shopping spree, or watch the world go by in a cafe or restaurant. Freudenstadt offers sportive activities for the entire family all around the year. The Panoramabad is an oasis. The large wellness area with sauna, grottos and whirlpools is perfect for those seeking relaxation. Swimming pools (indoors & outdoors), a 47m water chute and a special basin for small children offer fun for kids and adults. Freudenstadt is actually at the edge of the central & northern black forest, so visitors have a lot of opportunities from here. Alpirsbach (population 6600) - the town is full of history and tradtions. Visit the museum in the former Bendictine Abbey Alpirsbach (founded 1095). It was in the abbey where beer brewing in Alpirsbach began. Today, the Alpirsbacher Klosterbräu brewery produces several awarded types of beer. The brewery has been family-owned since 1880. Learn in the brewery museum about beer brewing in former days and see the historc machinery. You can also watch a glass-blower at work after advance notification. 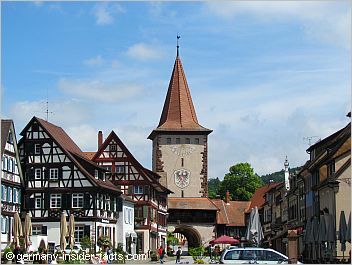 Schiltach (population 3900) - the beautiful ensemble of half-timbered houses in the town centre are worth a visit. Actually the centre is under monument protection because of the rare closeness of the old houses. The Apothekenmuseum (pharmacy museum) on the market square is located in the building of the former Ratsapotheke. See the original dispensary and how much work was involved to prepare medicine before the advent of the pharmaceutical industry. Wolfach (population 5800) is a traditional stronghold of the Swabian-Alemannic Fastnacht. The town was once an important centre of timber rafting, you can learn about this old trade in the timber rafting museum. Every 2 years the timber rafting festival is celebrated. Highlight is a visit of the Dorotheenhütte glass manufacture. Watch the glassblowers at work, how they turn the hot, liquid glass mass into a masterpiece of art. The glass museum tells about 2000 years history of glassblowing, while the Christmas village, with 35 nicely decorated huts and stands, provides Christmas atmosphere all around the year. Hausach (population 5800) - A model railway is Hausach's biggest attraction, not only for the kids. The 400m² complex displays the original Schwarzwaldbahn (black forest railway) at a scale of 1:87. The railway stations of Hausach, Hornberg and Triberg, as well as lifelike black forest scenery make the model railway complex very real. Haslach (population 7000) was once a centre of silver mining. Impressive half-timbered houses in the town centre are proof of the former wealth. 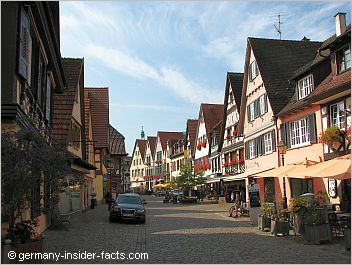 Haslach is a great place to go for a shopping spree, or dine in one of the local restaurants. The Trachtenmuseum (costume museum) in the former Kapuziner abbey displays a wonderful collection of traditional costumes from all regions of the black forest. Gengenbach (population 11,000) has preserved parts of its medieval city wall. Five remaining watchtowers, the historic town centre, culture and history make Gengenbach a real treasure. Don't miss the picturesque Engelgasse where half-timbered houses lean against the remains of the old town wall. Every year in December, the town hall converts into the world's biggest advent calendar house. The 24 windows of the town hall are decorated with motifs, and each night another window is lit. Offenburg (population 59,100) is a major traffic hub and economic centre on the western edge of the Schwarzwald. Burda Publishing house, Tesa (adhesive tape) and other companies have their headquartes in Offenburg. From a tourist point of view the city has nice old buildings around the market place and fish market. Several festivities and fairs are held throughout the year. 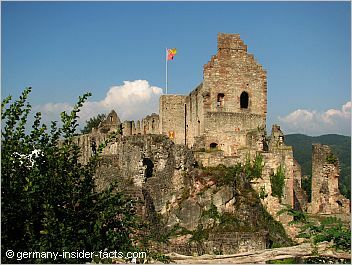 Offenburg offers a wide range of accommodation, so it is a good place to stay and discover the surroundings from here. Are you wondering where to stay? Use the search tool to find hotels in the black forest. From Hausach take the B 500 for a wonderful drive south along the valley of the Gutach. You are now in "cuckoo clocks country". The region from Triberg to Furtwangen has been the heart of the black forest watchmaking industry for centuries. Schwarzwälder Freilichtmuseum Vogtsbauernhof is a fantastic open air museum just a few kilometres south of Hausach. Discover the rich culture and history, see how people have lived in the black forest for centuries. The name Vogtsbauernhof comes from the oldest farmhouse that was built on the site in 1612. Another five farmhouses, typical for their region, have been dismantled and moved to the museum. The museum is an exciting, educational and preserving place. Interested visitors can learn as much as they want about customs and long forgotten crafts, old breeds of farm animals, old mechanic devices and much more. Allow yourself a few hours for the visit. The museum is open from the end of March to early November. 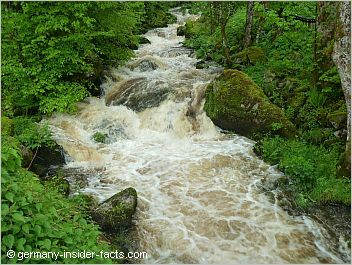 Triberg (population 4900) is most famous for its waterfall. The Triberg waterfall is promoted to be the highest waterfall in Germany (163m). However, the Röthbachfall in the Berchtesgadener country is actually much higher (470m). Fact is that the Triberg waterfall with seven cascades is a natural beauty, and a popular tourist destination. Access is either from the middle of Triberg, or from four other entry points. The Triberg waterfall is especially appealing in winter when the falls turn into frozen, glistening wonderland. The waterfall is illuminated from dusk until 10pm. You can see the world's biggest walk-in cuckoo clock in Eble Uhren Park just south of Triberg in Schonachbach. The clockwork of this large cuckoo clock (scale 60:1) is an unique replica of an original clockwork. A short drive off the main road from Triberg leads you to Schonach. The town is a winter sports centre and home of the first world's largest cuckoo clock. Furtwangen (population 9300) is home of the German Clock museum (Deutsches Uhrenmuseum). Unusual clocks, and black forest clocks as well, have been collected in the museum since 1852. Also in Furtwangen is the oldest German school for watchmakers. It was founded by Robert Gerwig in 1850. Gerwig collected clocks from the region for teaching purposes. This clock collection was the foundation of the clock museum. Enjoy stunning views over Furtwangen and its suroundings from the lookout tower on the Brend (1149 m) mountain. Furtwangen often has lots of snow in winter and a sunny climate in summer, the perfect holiday destination. From Furtwangen the Bundesstrasse B 500 runs southwards to the southern black forest regions, but we don't want to go there now. The main road to the northwest form Furtwangen follows the valley of the Wildgutach downstream, and it is also known as Simonswäldertal. I can never decide which one is the better way to enjoy the stunning drive, uphill or downhill. The scenery is just breathtaking. You'll see impressive farm houses on the slopes of the steep mountains, and wonder how people ever get to their house, especially in winter. Narrow, winding roads along romantic valleys lead to hidden places named Wolfloch (wolf hole) and Hexenloch (witches hole). This is the country for hiking, motorcycling and self-driving. 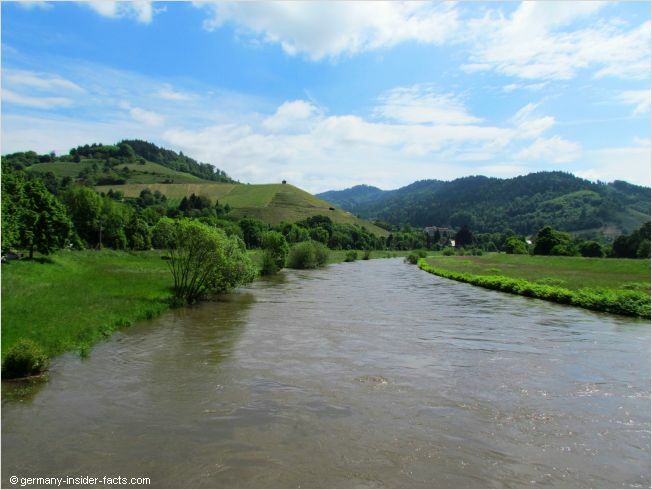 Nature and the fantastic scenery is the main attraction, not only here but everywhere in the black forest. Hexenlochmühle is the only mill with two water wheels in the black forest. You can still see the mill at work. This little gem is a great place for a rest after a hike, to relax and explore the exciting shops inside. Yes, you can buy original black forest souvenirs, cuckoo clocks and the delicious Schwarzwälder Schinken at the Hexenloch mill. Passing St. Peter and St. Märgen on a sunny plateau you can either drive via the Kandel mountain to Waldkirch, or along the Glottertal to Emmendingen. Kandel (1241 m) is worth a visit all around the year. Activities on the summit include hang-gliding and paragliding, rock climbing, and hiking. Motorcyclists and cyclist love the challenging drive up and down the Kandel. There are bus connections from Freiburg, Denzlingen and St. Peter to the summit area. If none of the activities are appealing to you, go to the Kandel just for the stunning views. Freiamt - Want to spend a few days away from the touristy places? Enjoy hiking in lovely surroundings? Freiamt is the place to go. Five townships (Ottoschwanden, Mußbach, Reichenbach, Keppenbach und Brettental) were put together to form Freiamt, each district is an unique village. Freiamt is like a second home to me, after all, I have spent my holidays here in a lovely holiday flat for many years. The flat is not available anymore, however, I love to return and relax at the Freiämter Hof and enjoy the hospitality of the lovely hosts. If you don't feel like driving yourself in the black forest, I recommend a tour with a private tour guide. He can drive you to all these beautiful places. 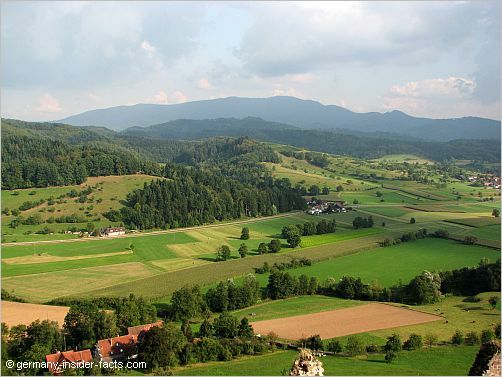 Now are you convinced that the central black forest is the ideal holiday destination? Use this map to plan your trip to the central black forest or another beautiful part of the Schwarzwald. The Michelin Southwest Map 545 covers Baden-Württemberg and the black forest.